Houdini uses a mathematical pinhole camera to simulate a camera. Because a pinhole camera does not have in-camera effects such as depth of field and bokeh, you must be explicitly tell mantra to simulate them (see below). Unlike some other packages, Houdini’s viewport view does not necessarily correspond to a camera. You can lock the viewport to a camera (so changing the view moves/reorients the camera), but normally the current view in the viewport is separate from any cameras. There are also many options to render the current view without creating a camera. On the shelf, click the Lights and Cameras tab. 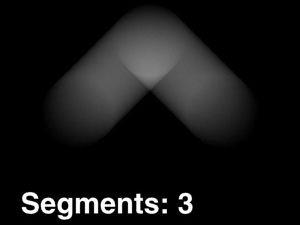 Hold ⌃ Ctrl and click Camera or a light to create a camera/light using the current view. If you click Camera or a light without ⌃ Ctrl, you can position the camera manually, then use the handles to move and point the camera/light. Choose the camera from the camera menu. Click the Lock Camera/Light to the view button, which is located on the toolbar on the right side of the view. You can also lock the camera to view by by turning on Tie Camera (or Light) to View in the camera menu. Use the view keys to change the view. The camera/light moves and rotates to match the view as long as Tie Camera (or Light) to View is on. When you've positioned the light/camera, click the icon again or turn off Tie Camera (or Light) to View in the camera menu. By default, the view is exported to the camera or light when the mouse button is released. This behavior can be overridden by turning on Export View Continuously in the camera meu. This option should be used with caution as exporting the view can trigger cooking. There are three types of blur. Transformation blur blurs moving objects overall. 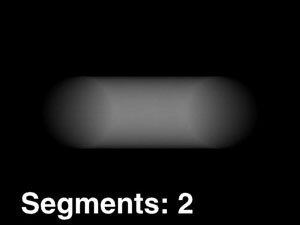 To blur the moving pieces of deforming geometry, there are two options. Velocity blur uses the v velocity attribute on points in deforming geometry. This requires that the velocity attribute exist on the geometry. Since the attribute is not recalculated at each sub-frame, this method cannot blur deformation along a curve. This method works even if the topology of the geometry changes between frames (as with particle systems, where new points may be born or die between frames). Geometry blur sends separate copies of the geometry to mantra for each sub-frame. This requires that the topology of the geometry does not change between frames. Since this method requires sending multiple copies of the geometry to mantra, it is necessarily slower. Motion is evaluated at sub-frame intervals. If you use expressions to animate objects or deformations, you should use $T (floating point time) or $FF (fractional frame number) in the expressions instead of $F (integer frame number). Expressions that use $F will not show motion blur properly (since the expression will give the same result at every sub-frame). In the parameter editor for the render node, go to the Properties ▸ Sampling sub-tab and turn on Allow motion blur. 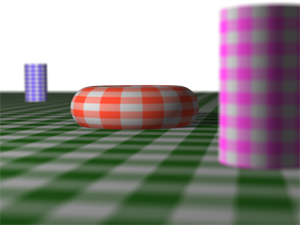 This enables transform motion blur for all objects. To enable motion blur on individual objects, add the Allow motion blur property to the object and turn it on there, instead of on the render node. In the parameter editor for the render node, go to the Properties ▸ Sampling sub-tab and increase the Xform Time Samples parameter. 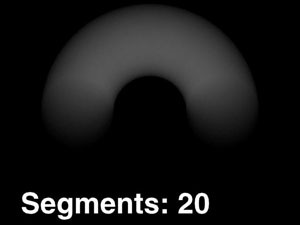 This blends between more sub-frame positions, giving more accurate but slower rendering of objects moving along a curve. Turn on motion blur on the render node (see above). On the deforming object, you need to have v (velocity) attributes on the points. This attribute contains a vector describing the current velocity of the point. Particle systems have velocity attributes automatically. For other types of geometry, in the geometry network, connect a Trail node and set its Result type to "Compute velocity" to have it add the velocity attribute to the points. In the parameters for the geometry object, click the Render ▸ Sampling sub-tab and turn on Geometry velocity blur. 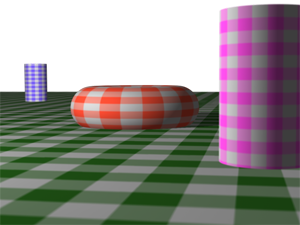 On the deforming object, add the Geo time samples render property. Set it to the number of sub-frame samples of the geometry to calculate for each frame. You must have a velocity vector field for the volume to use motion blur (vel.x, vel.y, and vel.z). For volumes imported from a simulation network, you can import the Velocity field from the DOP object into SOP as vel. For other volumes (for example, loaded from disk caches), you can use a Volume Velocity node to calculate a velocity field for the volume. Volume shaders will recognize the vel field and use it to do motion blur at render time. It is not necessary to turn on the Geometry velocity blur parameter on the object. See the parameter descriptions on the mantra render node for more information. You can turn on depth of field by turning on Enable Depth of Field on the Sampling sub-tab of the Properties tab in the parameter editor of a render node. There are four parameters that control depth of field. The Focal Length parameter is on the View tab of the camera node. The Focus Distance, F-Stop, and Bokeh parameters are on the Sampling tab of the camera node. The lens focal distance and distance from the camera at which objects will be in focus. If the fstop channel is also used, objects outside this distance will be blurred. Determines blurriness of depth-of field effects. The Motion Factor parameter on the render node can be used with extreme depth of field. 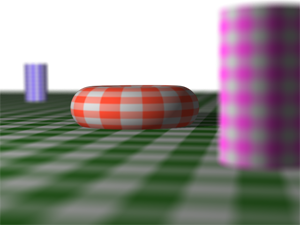 This allows you to decrease the Shading Quality based on how blurred the object is. 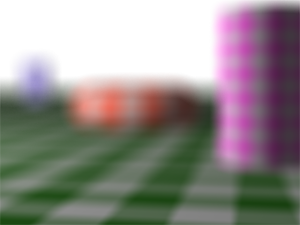 Objects that are not out of focus will have their specified shading quality. 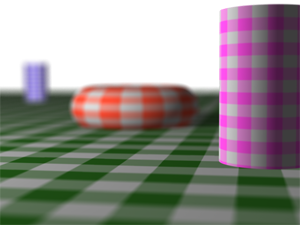 Objects that are heavily out of focus will have their shading quality decreased. This will affect render times with little perceptual loss in image quality. The following images show the effect of changing F-Stop. The Focus Distance is set at 12, and the Focal Length is set at 200mm. The following images show the effect of changing the focus. The Focal Length is set at 200mm, and the F-Stop is set at 1. Bokeh simulates how different lenses, apertures, and reflections inside the camera body affect how elements blur outside the depth of field. It makes bright points in the out-of-focus background appear as large transparent discs, boxes, or hexagons (depending on the camera). Mantra lets you use radial (circular) or box bokeh, or specify an image representing the shape to use for blurred bright spots. In the parameter editor, click the Sampling tab. Use the bokeh parameters to control the look of the out of focus elements. This is useful for overlaying information, for example to display a slate over top of the view for flipbooking. 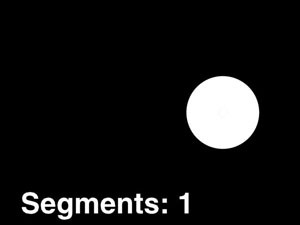 This does not actually gate or gobo the camera/light, it only affects the viewer. Create a geometry (SOP) network to generate the graphics. Houdini scales the portion of the mask geometry between 0 and +1 X and Y to the viewport size to create the overlay. Create a camera and choose Edit Rendering Parameters from the gear drop-down menu. In the Edit Parameter Interface window, expand the Viewport Display folder, select the View Mask folder, and click the add arrow. This will add the View Mask tab to the parameter editor. In the camera node's parameter editor, click the View Mask tab. Set the Mask aspect to control the gating of the view. If you created overlay geometry, click the + button next to the Mask overlay SOP parameter and choose the node containing the overlay geometry. To see the overlay, look through the camera or light, and turn on Camera mask on the Guides and Markers tab of the display options window.